1. Fill a large pot with water and bring to a boil. Add a little oil to the water to keep the pasta from sticking together. Once boiling, add pasta. 2. While waiting for water to boil, clean and thinly slice mushrooms and garlic. Cut tomatoes into halves. 3. When pasta is done, drain, rinse and set aside. 4. In a large nonstick skillet, add the olive oil and heat under medium-high flame. Add the garlic - sauté just until it becomes aromatic, 1-2 minutes. Add the mushrooms to the garlic and cook until the mushrooms just start to become soft, 1-2 minutes. Next add the shrimp and tomatoes and toss lightly for 1-2 minutes. Last, add the pasta, toss and cook for another 3-4 minutes. 5. 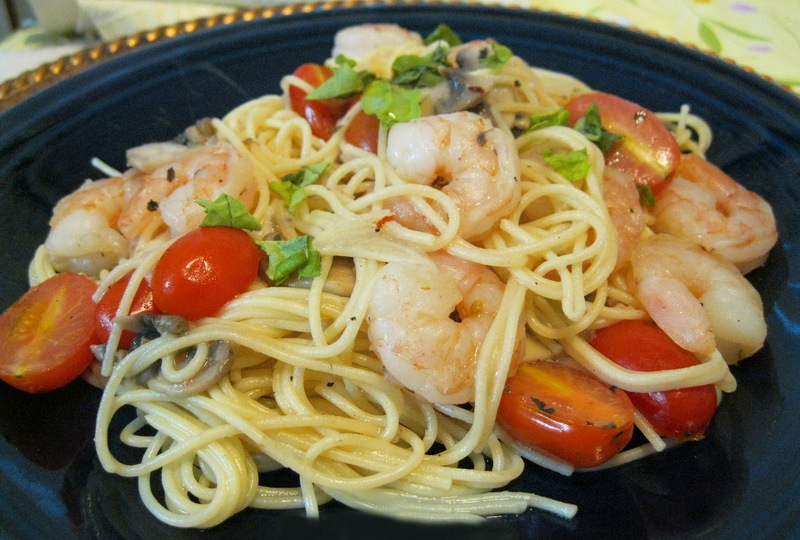 After plating, drizzle lemon juice over shrimp/pasta and top with fresh basil. I hadn't planned out quite right when the pasta would be done and starting on sautéing the garlic. So I just moved the skillet to the back burner and finished the pasta, set it aside and went back to cooking the rest of the dish. Though this dish is high in cholesterol, you have to delve further. In the case of shrimp, though it does contain some "bad" cholesterol, also known as LDL, it contains a significant amount of "good" cholesterol, also known as HDL. Remember, not all cholesterol is bad. And in this case, shrimp is definitely on your healthy side.